Home » Personal Finance » Taxes » Are You Withholding the Right Amount of Taxes from Your Paycheck? On the other hand, the 27 percent of taxpayers not receiving a refund may be getting the opposite — a big tax bill. They may not be having enough money withheld from their paychecks for taxes. With the passing of the Tax Cuts and Jobs Act, many Americans are still trying to figure out the full effects of this legislation on their paychecks. In an effort to help taxpayers make sense of recent changes to the tax law, the IRS updated its Withholding Calculator on February 28, 2018. Here's your game plan to achieve a "Goldilocks" withholding rate on your paycheck this year. If you don't receive a pay stub in the mail, contact your human resources office to get a copy or learn how you can download one online from your company portal. Depending on your unique financial situation, you may also want to find your 2016 return (or your 2017, if you've completed it) to more accurately estimate your 2018 income, budget, expenses, and list of tax credits. In the first two sections of the IRS Withholding Calculator, indicate your filing status, whether or not anybody can claim you as a dependent, how many jobs you and your spouse (if applicable) have, how many dependents you will claim on your return, and whether or not you or your spouse will be 65 or older on January 1, 2019. Next, enter your gross wages, salaries, tips, and any bonuses you expect to receive in 2018. Using your most recent pay stubs, enter the total federal income tax withheld to date in 2018 and the federal income tax withheld from your last salary payment. Indicate how frequently you receive your paychecks, and, if applicable, when you started this job in 2018, and when you expect this job to end in 2018. If you receive any other taxable income, make sure to include it as well. The IRS Withholding Calculator is only as accurate as the information you enter, so leaving that income out may result in a higher tax liability. Here is one of the biggest changes implemented by the Tax Cuts and Jobs Act. If your standard deduction ($12,000 for individuals, $18,000 for heads of household, and $24,000 for married filing jointly) is more than your total itemized deductions, your standard deduction will be used to calculate your withholding. Otherwise, your total itemized deduction amount will be used. So, this is why it still pays to keep track of all of those deductions throughout the year. Once you have entered all the data, the IRS Withholding Calculator will provide you with clear instructions on how to update your W4 with your employer. Depending on your situation, some action items may include changing your filing status, adjusting your number of allowances, and withholding an extra amount every paycheck. Following the instructions from the calculator, you'll cover your tax liability just right. Don't set it and forget it. If your job (Promotion? Salary bump? Side gig?) or life situation (Married? Baby?) changes, revisit the IRS Withholding Calculator. 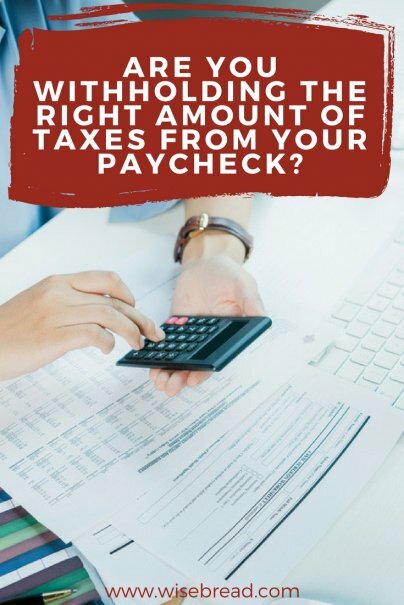 The calculator will help you make sure you have the right amount of tax withheld from your paycheck at work. The IRS recommends submitting your updated W4 to your employer as soon as possible. Withholding takes place throughout the year, so it's better to take this step right away.